Bentley, one of our PBBHW pups, has completed his Pet Partners national registration and training and is officially a pet therapy provider! Animal Assisted Therapy is particularly useful for children struggling with expressing themselves and there is much research including those diagnosed on the Autism Spectrum benefiting from this modality along with traditional psychotherapies. 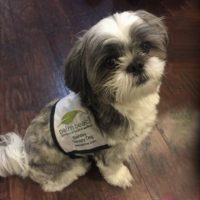 Bentley is a 1 year old Shih Tzu (non-shedding and hypoallergenic) who has begun some part time work with PBBHW!